e-Learning for Healthcare (e-LfH) is a Health Education England programme in partnership with the NHS and professional bodies that provides high-quality free content to train the NHS workforce. It was set up in 2007 to deliver a range of programmes, from anaesthesia to audiology and from end of life care to equality and diversity. 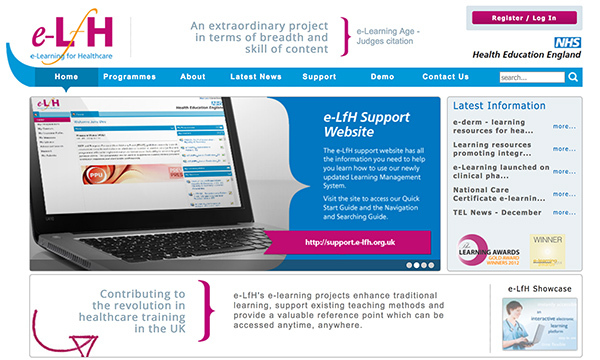 e-LfH offers a large number of learning tools, which are presented in alphabetical order. Now a new e-learning tool has been launched to better support NHS clinicians in how to meet the diverse needs of all patients and families. Called Cultural Competence, it aims to support clinicians to understand issues concerning culture and health and how these issues could influence health care outcomes. Three short modules include animation, activities and opportunities for reflection. These days HIV is a treatable long-term condition. With early diagnosis and prompt treatment, people with HIV can lead normal lives. However, two out of five people are diagnosed with HIV at a late stage, a statistic that has remained stubbornly high. While up to three quarters of people present to primary care with HIV-related conditions, HIV is still being missed. This website aims to provide simple, digestible information to educate and support general practice staff to normalise HIV. It has resources to support staff to carry out HIV testing. The interactive resources and tools provide simple, digestible information so that staff can start testing immediately. Testing for HIV is a simple intervention that can save lives. A four-page resource on concerns patients may raise about HIV testing. A section including tips on how to respond to these concerns is particularly useful. Can virtual learning environments be used as research platforms?